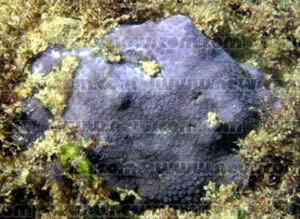 A new species of blue coral (Porites decussata), which has small colonies 5-6 cm across, has been found in numerous sites in Oman. MUSCAT, Oman -- Two new species of coral have been discovered off the Omani coast, as well as other existing coral species that had previously not been known to live in the area. There are now estimated to be approximately 130 species of coral off the coast of Oman, much more than was formerly thought to subsist in the region. Scientists believe there are probably at least twenty more species yet to be discovered, possibly including five more new to science. The two new species, discovered by Dr. Michel Claereboudt, a coral reef biologist with the Sultan Qaboos University and a coral researcher associated with the Environmental Society of Oman, include the blue coral (Porites decussata) and the sixteen-finger flower coral (Calathiscus tantillus). The sixteen-finger flower coral is very rare and unusual, with short-lived colonies that are probably limited in distribution and found only in Oman including the Daymaniyat Islands. In contrast, the blue coral, which has small colonies 5-6 cm across, has been found in numerous sites in Oman and will most likely be discovered in other areas of the Middle East. "Discovering a new species is very exciting," said Dr. Claereboudt. "Any new piece of the puzzle that facilitates the further understanding of the evolution and geography of corals and how they have moved from one continent to another is very important. In Oman, one species discovered recently by Dr. Charles Sheppard, Parasimplastrea sheppardi, was originally described as a four-million-year-old fossil from an exposed cliff in Papua New Guinea. This living coral fossil discovery is as important scientifically as the finding of the coelacanth, a living fossil fish." Corals belong to a large group of relatively simple and colorful organisms called Cnidaria. The organisms responsible for the fundamental building process of the reef are the tiny polyps of the corals, which in association with microscopic algae safely embedded in their tissue, continuously secrete a skeleton of limestone. Coral reefs are made mostly of the "dead" limestone skeleton covered with a thin veneer of living coral tissue composed of thousands of small, tube-like polyps. Another important discovery made in the Daymaniyat Islands, a nine-island archipelago off the coast of Muscat, is the actual expansion of the coral reef, despite rising water temperatures due to global warming that have adversely affected other coral reefs around the world. In 1998, Indian Ocean coral reefs were very badly impacted. Areas such as the Maldives, Seychelles, and Chagos lost 90 percent of their corals over vast areas. During this time the resilient reefs in the Daymaniyats continued to expand. This measured growth of coral reefs proves that Oman is in fact home to a much more diverse reef environment than formerly thought, with species more capable of withstanding varied ocean temperatures than in most other reef environments in the world. The extensive coral growth was found as a result of systematic investigations by biologist Robert Baldwin of the Environmental Society of Oman (ESO) and coral reef biologist Dr. Charles Sheppard, of the University of Warwick in England, who work in collaboration with Dr. Claereboudt. The ESO has been working very closely with the government of Oman to ensure these reef structures are protected and maintained, both for their positive environmental impact and their potential impact on tourism for many years to come. "The coral reefs of Oman are more diverse than originally thought, and their contribution to the world fauna is also much higher than expected," said Dr. Sheppard. "Some of these newly discovered coral species contribute as much to the world fauna as the panda, the blue whale or the Bengal tiger, and ought to as such be equally preserved." The Omani government has taken significant steps toward conserving these rare and valuable corals from the imminent threats of anchors; coastal development; and fishing nets, traps and lines. To ensure protection for the reef areas, the government and ESO are working very closely on this important project with the Wildlife Conservation Society (WCS) and The Indian Ocean Research and Conservation Association (IORCA), both of which receive funding from the Kerzner Marine Foundation (KMF). KMF, funded by resort company Kerzner International, seeks to foster the preservation and enhancement of global marine ecosystems through scientific research, education and community outreach. The preservation of the coral reefs in the Daymaniyat Islands marks KMF's first project in the Middle East. "There is not much we can do to change the global temperature of the ocean, but we can change our recreational and fishing practices to avoid the needless destruction of these coral reefs," said Baldwin. "Their survival depends on it." It is interesting to know that more species of corals have been discovered.I study marine ecology and organisms and i have a lot of interest in marine ecosystem. I hope more scientists can come to Fiji and discover lots of species that we cannot identify..